Pictures are included in the text as 'thumbnails'. Click on the thumbnail to see the large version. This page describes British field artillery ammunition - cartridges, shells and fuzes used in World War 2 (WW2). It focuses on ammunition for guns of British origin, although the underlying principles are widely applicable and the various types of ammunition had their equivalents in other armies. For the effects of shells see the 'Effects and Weight of Fire' page. Building on the WW1 experience of ammunition design and its mass production, the period between the two world wars saw substantial R & D effort into ammunition by engineers and scientists in the Research Department at Woolwich Arsenal. They took direction from the Ordnance Committee and the RA Committee. This work led to many improvements to WW1 developments. It focused on produceability and developing better manufacturing processes and finding lower cost and more readily available materials. See the 'Higher Organisation' page for more information about the arrangements for requirements and R&D. The old generation of British rockets (Hale's that had replaced Congreve's), dating from the mid-19th century and used into the early 20th had been declared obsolete in about 1921. However, renewed interest in rockets had started with Alfred Nobel in Sweden in the late 19th century and was picked up by Krupp. Continued German (and Russian if UK knew of it) interest led, in 1934, to British studies and experiments with 'unrotated projectiles' (UP), with anti-aircraft as the first priority. However, ground-to-ground use was given no priority and their eventual use in 1945 was developed from air-to-ground rockets. UP are not described further on this page. By WW2 ML ordnance meant mortars, with the 'bomb' being dropped tail first down the barrel from the muzzle. However, the 4.2-inch mortar was not ML but SB - 'smooth bore'. The main focus of this page is QF and BL ordnance but mortars were used by artillery and ML ammunition is described briefly. The term 'QF' originated with the late 19th century introduction of field guns firing rounds comprising propellant packed in brass cartridges (with a shell fitted to their mouth) that were loaded through the breech with the cartridge case providing obturation. This method, coupled with the introduction of buffer/recuperator arrangements for controlling recoil, provided high rates of fire hence 'QF'. Subsequently most QF cartridges had two or more cloth bags, containing propellant, in the metal cartridge case. See the various gun data sheets attached to the 'Guns' page for more details about charges for specific guns. 'BL' meant that propellant was loaded in cloth bags without a metal cartridge case and the breech mechanism provided obturation - a Crossley pad in British guns. By WW2 QF guns used sliding breech blocks and BL used screw blocks with interrupted threads - the Asbury single action opening mechanism and Welin parallel screw. The largest calibre QF ordnance used by British field artillery was the 4.5-inch Howitzer introduced in the first years of the 20th century and remaining in service until late in WW2. The WW2 4.5-inch Gun was BL (but just to confuse matters the 4.5-inch naval and AA guns were QF). The difference between QF and BL ammunition (and ML) was the 'packaging' of the propellant charge and its means of ignition. This is explained in the following sections. Quality control was important as was the ability to identify defective production 'runs' of ammunition so that they could be removed from the supply chain. This was called 'lotting and batching'. Basically components, such as HE, shell bodies, fuzes, fuze magazines, etc, (which typically all came from different factories) were each given lot numbers for each production run. When the various components were assembled into a shell each combination of lots was given a batch number. Figure 1 shows a QF round, 25-pdr in this example. In the 25-pdr the projectile and cartridge were separately loaded into the breech, with the projectile being rammed so that the driving band engaged the rifling of the barrel. The primer was fitted in the base of the metal cartridge case and ignited the propellant, which was held in cloth charge bags in the cartridge case and retained there by leatherboard cup. The primer, which contained gunpowder and protruded into the cartridge, was initiated when struck by the firing pin in the breech mechanism. It ejected a flame into the cartridge case causing the propellant to ignite and explode. Figure 2 shows the primers used with 25-pdr cartridges. The 'pea ball' was forced back when the propellant exploded and prevented any gases escaping. The cartridge case had two purposes, it was a 'container' for the propellant and primer, and it provided obturation (prevented propellant gases escaping through the breech). The British mostly used brass (70% copper, 30% zinc) cartridge cases (although the 25-pdr cartridge case Mk V was steel coated with brass), and with some the base was protected by a safety clip that guarded against the primer being accidentally struck and prevented the primer from working itself loose. These clips were removed before firing. The charge bags were variously called 'portions' or 'sections' of the propellant charge. No 1 portion (the core charge) being Charge 1, portions 1 and 2 being Charge 2 and all three portions being Charge 3. Each portion contained a different amount of propellant and in the 25-pdr their bags were coloured red, white and blue. 25-pdr had a second cartridge for Charge Super. When Charge 1 or 2 were ordered the blue and or white bags were removed from the cartridge case. In 1944 intermediate charges were introduced to better enable upper register fire by 25-pdr. They were provided as increment bags that were added to a standard charge in a cartridge - one increment to charge 1, one or two increments to charge 2. This took 25-pdr from a 4 charge to a 7 charge gun. With QF ammunition the projectiles were delivered fuzed with the 'standard' fuze, No 117 in the case of 25-pdr. 25-pdr shells were delivered in steel boxes of 2 or 4 and their cartridges in steel boxes of 8, the cartridges being individually packed in their own waterproof containers. Spare primers were also provided so that in event of a misfire the faulty primer could be replaced. The removed charge bags were usually destroyed by being burnt, but used cartridge cases and empty packing boxes were salvaged whenever possible. In the weeks before D-Day 1944 a problem emerged. Somewhere deep in the ammunition supply system it was decided to replace the No 206 cartridge box (19�10�12 inches) used for 25-pdr cartridges with a new No 267 box. (28�10�10 inches) The problem was that No 267 was bigger and the prescribed first line stocks could not be carried boxed in either the Field Artillery Tractor (FAT) or the Sexton SP gun! Since reducing first line stocks was unacceptable, as was a vehicle re-design, units carried No 206 boxes and repacked cartridges from the No 267 boxes. The problem was eased by re-bodied FAT, at least for those on Morris C8 chassis, using a GS body that provided more flexible stowage among other improvements. QF rounds can be of three types: separate loading (as in the 25-pdr, shell and cartridge were loaded separately with the shell being rammed), fixed (the shell was 'fixed' in the cartridge case as in small-arms ammunition, this was only used with true 'guns' that had a single propellant charge as in naval, AA, tank or anti-tank and the 18-pdr field gun), or semi-fixed where charge bags could be removed but the cartridge and shell were then 'mated' and loaded together as a complete round (the US 105-mm Howitzer M1 being the leading example). Figure 3 shows a complete round of 5.5-inch ammunition, a BL type, ie no metal cartridge case. Both Britain and the US used BL for almost all field artillery larger than 105-mm. In contrast continental European armies tended to use metal cartridge cases (QF ordnance) for almost all calibres of field artillery, for example Germany used cased charges for all field guns and most railway guns and the USSR used them for all their 122-mm and 152-mm, Sweden still uses metal cartridge cases for modern 155-mm. In BL guns the projectile and cartridge were again loaded separately, but in addition a tube had to be loaded into the 'lock' fitted to the outside rear of the breech. This tube (sometimes called a primer by other nations) is similar in size to a rifle cartridge, much smaller than the primer used in QF rounds, and delivered in cartons of 10 in boxes of 20. Tube, Vent, Percussion Mk 6 (0.5-inch) was initially used but Tube, Percussion Mk 3 (0.303-inch) and its variants Mks 4 and 5 replaced it, all were filled with gunpowder. The tube was struck by a firing pin, that was part of the lock, via a lanyard clipped to the lock. This initiated the tube and a flame was projected through a vent into the breech chamber where the propellant charge was. However, its flame was not as strong as that from a QF primer and it had a lot further to travel, so the bottom of the base charge bag had a built-in gunpowder igniter that in turn produced a flame powerful enough to ignite and explode the propellant. In some cases the top of the base charge bag also had a gunpowder igniter to ensure rapid ignition of the next charge bag. Auxiliary igniters were also provided in case fitted igniters became damp. A BL breech mechanism is shown in the 'Gun Characteristics' page. Obturation was provided by the breech mechanism. There were two cartridges for 5.5-inch, Charge 2 and Charge 4 (shown in Figure 2 above), with a third Charge Super added when the 80-lb shell was introduced in 1943. The former comprised Charge 1 and an increment, the second Charge 3 and an increment. When Charges 1 or 3 were ordered the increment was removed from the appropriate cartridge before loading it. Only one cartridge was loaded. The particular problem for BL guns was that charred fragments of the charge bag cloth could be left in the chamber, and these could ignite the next charge bag loaded. It was therefore usual to swab out the breech between rounds, which reduced the rate of fire. 5.5-inch propellant was delivered in steel boxes of 6 cartridges of the same type. Projectiles were delivered individually and fitted with a plug screwed into the fuze well, they were not boxed but their driving bands were protected by a hemp 'grummet'. Ammunition preparation by each gun detachment included removing the grummet and plug and fitting the fuze. Figure 5 shows the complete propellant charge for the 7.2-inch BL howitzer. In this case Section 1 has a core that protrudes the full length of the complete charge with sections 2 - 4, and eventually 5 as shown, wrapped around it and secured by tapes. Propellants are low explosives comprising fuel and an oxidant, they are designed to deflagrate and create a large amount of gas very quickly to provide force to move a projectile through a gun barrel. The expanding gas accelerates the projectile along the barrel until the point where all the fuel in the propellant is burnt, thereafter velocity decays due to countervailing forces. British artillery propellants were originally called cordite, a double base propellant which was introduced into British service during 1891-3. Double-base propellants were a chemical mixture of nitrocellulose, nitroglycerine and additives. They were the main propellant used throughout WW2. There were various compositions that evolved and several types were available for each type of gun, for example 5.5-inch initially had W and WM and RDQ (a triple base propellant), these had far less nitroglycerine than the original cordite. W was the 'standard' propellant for artillery at the beginning of WW2. By WW2 most field artillery ammunition, whether QF or BL, had propelling charges in bags. Before WW2 most charge bags were made from worsted wool or shalloon (fine wool used to line suits). Nevertheless cambric (linen or cotton) was used with 25-pdr, although cotton and linen were notable for incomplete burning, but this did not greatly matter with metal cartridge cases fitted with caps to close their front ends. It was an issue with BL guns (glowing embers in the chamber could ignite a charge bag, although swabbing-out was used to deal with this) so silk or shalloon were preferred. Silk had barrel wear reducing properties, which increased its attraction. Having several types of propellant, eventually 7 for 5.5-inch and 10 for 7.2-inch, led to problems. As guns wore the change in muzzle velocity (MV) varied with the type of propellant. Furthermore different production 'lots' of the same type of propellant performed slightly differently (although weights were adjusted for differences in propellant energy), which was exacerbated in worn guns. These problems required propellant to be sorted into types and lots on the gun position. The Gun Position Officer (GPO) could order the type and lot for use in a particular shoot, and this ensured consistency in the fall of shot. However, the accuracy of predicted fire was reduced if the guns were not calibrated for the type and lot in use. In the last months of the war there were so many different types and lots on gun positions that sorting had to be abandoned, which had an adverse effect on the accuracy of predicted fire. Later in the war some US single-base (nitrocellulose) propellant was taken into service. Before this the British had generally avoided single-base propellants due to its drawbacks, although NCT had been used in WW1 but was declared obsolete when the war ended. Most notably it was hydroscopic (it absorbed moisture). However, Dupont had created a 'non-hydroscopic' (NH) propellant that was adopted by the US. During the war the British, building on pre-war research, started introducing picrite based propellant, because it was flashless and cool burning. They called these double-base with picrite, although today they are usually called triple-base, but were produced in double-base production facilities. These were flashless and used carbamite instead of volatile solvents as a gelatiniser, and carbamite (diethyl diphenyl urea) was also a very good stabiliser. Picrite, a cover name for nitroguanidine, is a nitrogen rich explosive. The ballistic properties of artillery propellant are described in terms of its force, vivacity and form. Force is the energy content, vivacity is the intrinsic rate of burning and form is the shape of the propellant and affects its rate of burning and hence the rate at which its energy is released. Propellant shape is a critical issue because, along with chamber pressure, it affects its burning speed. The British generally used stick shapes called 'cords' (hence 'cordite'), with the sticks being between 1/10th and 1/20th of inch in diameter and up to several inches long, for example the base charges of 5.5-inch had cords about 15 inches long. The cross-sectional shape of propellant sticks was important because it affects the mass to surface area ratio. The greater the surface area the faster it burns and hence the rate at which the propelling gases are produced. A variety of cord shapes were used including tubular and slotted to increase the surface area of a cord. However, NH propellants were too brittle to be produced as cords. For some purposes the ideal shape ensures a constant burning rate, this reduces the peak pressure in the chamber, simple cord shapes have a decreasing rate of burning because their surface area shrinks as they burn. 'Flashless' propellants without picrite were also introduced during the war. 'Flashless' is a relative term, the British definition was that it 'was unlikely to attract the attention of the naked eye at 4000 yards'. Muzzle flash actually comprises three different types of flash: primary, intermediate and secondary. Most of the flash is from the last, which is caused by hot combustible gases, mainly hydrogen and carbon dioxide, mixing with air and burning. The first flashless propellants had added mineral salts such as potassium cryolite, which in some way limited hydrogen forming and burning. Their disadvantage was greatly increased smoke. Picrite based propellants (triple-base), using a substantial proportion of nitroguanidine, were flashless without adding salts. They were also cooler burning (reducing barrel wear by about half compared to double-base) and produced less combustible gases and far more inert nitrogen, hence less secondary flash. However, a charge using triple-base propellant was about 15% heavier than its double-base equivalent, but it also caused only about half as much wear. They called these 'N' meaning 'Nolite', and 'NQ' had sodium cryolite added. Slightly different formulations of N and NQ were used with naval munitions. Table 1 shows the proportions of materials in the single-base, double-base and triple-base propellants used by British artillery in WW2. The points to note are the amount of energy for unit weight (calories/gram), the more energetic the smaller the amount needed and the higher the exploding temperature. Basically the higher this temperature the greater the rate of barrel wear, although barrel wear also correlates with the proportion of nitroglycerine, and it was the high barrel wear experienced in the Boer War where Cordite Mk 1 was the only propellant that led to other dual-base formulations. Note: Ballistite, the name given to a 19th century proprietary double base propellant was not used with QF or BL guns. In WW2 UK used two formulations A and B. A was 39.5% Nitroglycerine (NG) and 60.5% Nitrocellulose (NC). B was 38% NG and 60% NC with small amounts of Carbamite, Potassium Nitrate and Graphite. Ballistite was used with mortars. The main types of propellant used by UK artillery in the 20th Century are shown in Tables 1 and 2. Cordite Mk 1 was mostly out of service before WW1, the Boer War had revealed its high rate of barrel wear, and by 1914 MD was the standard propellant. RDB became the standard propellant during WW1 because it was more convenient to produce. By 1939 W was the standard artillery propellant, N and NQ had been developed but had not entered service on a large scale. They became the only propellants used in UK designed ammunition after WW2. F marking meant the propellant was in flake form. Bofors cordite was used with 40mm and marked J. NC(Y) and M4X, used with mortars, were both marked M.
SC propellant required different production facilities to other double-base propellants, it was used for some artillery such as 25-pdr Charge Super, but its main use was as the standard propellant for naval guns. Single letter code markings were marked on packaging, cartridge case and charge bags together with the manufacturing Lot number. These were used to sort ammunition on the gun position. There were other minor variants of AN and N. Dinitrotoluene reduced the temperature and hence the rate of wear. It was important that charges using the same type of propellant produced in different production ' runs', called ' lots', were as close to identical in performance as was practically possible. This meant that they were subjected to propellant proofing. A small sample was tested by a standard method and the results compared to the ' standard', the propellant used to produce range table data. Any variations were corrected by slightly increasing or decreasing the weights, 'adjusted charge weight', of the propelling charges. This process had been introduced in 1915. US propellant names were acronyms, and for NH and FNH there were several formulations, Dupont and Hercules being the most common. UK names used letters with various meanings including codes for particular components or features. For example 'N' meant picrite, 'S' solventless, 'Q' high calorific value. Suffixes were also used to indicate propellant shape, eg: /T - tube, /S - slotted tube, /R - ribbon, /M - multitube, /D - drilled tube. These suffixes were not always preceded by a "/", particularly when it was "T". No suffix meant a simple cord. Finally the size was also given in hundredths of an inch, for simple cords '017' meant the cord was 0.017 inch diameter, for /T 124-045 meant the cord was 0.124 inch diameter with its central tube 0.045 inch diameter. The result was propellant designations in the form 'Cordite WM/T 316-100'. Propellant packaging was marked with a production Lot identifier with a letter code suffix (see Table 2) for the propellant nature. Bursting type, where the filling or part of it caused the shell to burst. The usual filling was HE where the bursting shell fragmented into small pieces but White Phosphorus (WP) was used to create a smoke cloud and bursting shells were also used with chemical fillings. Shells could be burst in the air by a time fuze, on the ground by an impact fuze, or with a slight delay using a graze fuze. The metal fragments produced by a WW2 HE shell bursting had a velocity between about 4500 and 9000 ft/sec. Shrapnel type, these were usually burst in the air and projected their 'payload' forwards acting like a shotgun. However, shrapnel could be used with a graze fuze against walls or other light cover which was penetrated before the payload was fired. The usual payload was shrapnel bullets but thermit 'pots' had been used in 'star' and incendiary shells during WW1. However, by the start of WW2 shrapnel was obsolete for field artillery although stocks of ammunition remained and it was used in Malaya (late 1941) and probably E Africa (late 1940). A modern shrapnel shell was produced for 3.7-inch HAA. The size of shrapnel bullets was defined by the number of bullets per pound weight, about 40 was normal for British shells. Carrier type, these were also burst in the air and ejected their payload backwards after blowing the base plate off the shell. The were used mainly for smoke, star and flare shells. Figure 6 shows the main external features of a shell. US shell designs tended to have a distinctive bourrelet where the ogive joined the narrower shell body, British designs had a seamless 'join' and this was sometimes called the shoulder. Unlike many other nations including US and Germany, British shells were precision machined over their whole length, which enabled the ogive to merge seamlessly into the shell body. Streamlined shells started appearing in WW1 because they gave greater range, after that war they became the norm. Streamlined shells are ballistically more efficient when the shell is supersonic throughout its trajectory, they are characterised by an ogive curved at greater radius and by a 'boat-tail' shell base instead of a square one. The length of these shells was between 3.5 and 4.5 calibres. The streamlined shape was essential for supersonic shells because it helped reduce pressure and skin drag. The ogive of a shell is the arc of a circle whose radius is defined in calibres (the shell diameter) and called the 'calibre radius head' (crh). In early shells the ogive was a tangent ogive, where the line of the shell body was at a tangent to the ogive. This meant the ogive was part of the circumference of a circle having its centre on a line through the shoulder (where the shell body and ogive meet) at a right angle to the long axis of the shell, point T in the illustration. In WW1 shells were generally about 2 crh but it increased during that war, to 8 in the case of 60-pr. 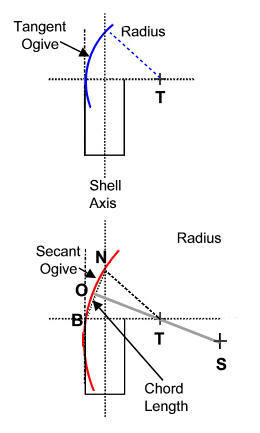 In the 1920's British shells adopted a fractional crh with a secant ogive, the shell body line is a secant line that cuts the circumference of the circle. For example the standard 25-pdr shell was 5/10 fractional crh, the 'optimum secant ogive'. The second number represented the crh of the actual secant ogive, the first number was the crh of the notional tangent ogive with the same chord length, straight line BN in the illustration. In the illustration the fractional crh is BT/SO. The position of S, the centre of the circle of the secant arc, is determined by bisecting angle NTB. It appears that UK may sometimes have rounded BT and SO off to the nearest whole number, the illustrated fractional crh is about 2/3.6. Some details of shells for each type of gun are in the gun data sheets at the 'Guns' page. 18-pdr gives an indication of the effectiveness of streamlining, the original Mk 1 (shrapnel) was 1� crh, then in 1915 the Mk 2 with 2 crh was adopted with the introduction of HE but in the 1920's a 4/7.5 crh design was introduced (Mk 1C). They were identical in weight and used the same cartridge, but for Mk 1C MV was 0.9 % and maximum range 16% greater than the WW1 Mk 2 design. 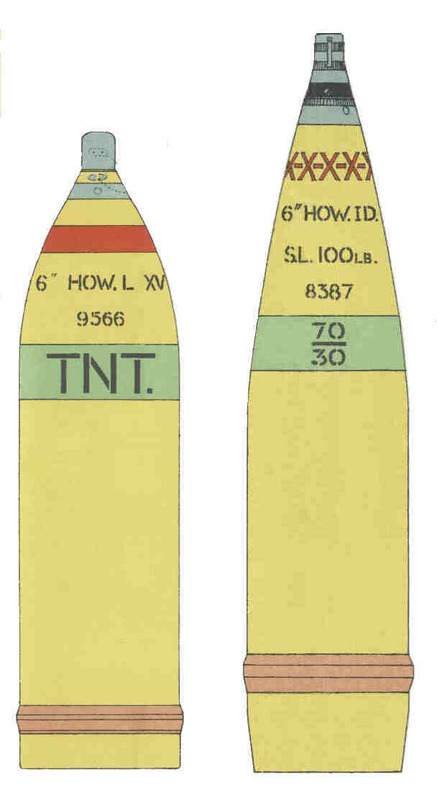 Figure 7 shows the 100 lb shells for 6-inch Howitzer. On the left is the late WW1 designed Mk 15 (fuze No 106E) with a 2 crh shape, on the right a Mk1D (Fuze No 119) filled with Amatol and with 10 crh designed in the 1930's. For comparison the US 105-mm M1 crh was 6.18. A second feature of the C and D series shells is the large 'boat-tail' behind the driving band which further reduced pressure drag. However, it also reduced chamber size (more shell behind the driving band) and so increased chamber pressure compared to the older designs if the same propelling charges were used. In some cases new charges were introduced for old guns with these 'streamlined' shells. In most cases projectile bodies were machined from forged and pierced steel billets, the pierced forging being an enhancement of a German process adopted in the 1930s. Such forging creates a longitudinal 'grain' in the steel that can have microscopic flaws across it. The firing forces mean that the explosive filling can weigh 40 tons on the bottom of the shell cavity and a failure could cause a premature in the gun's bore. Therefore a steel plate with its 'grain' at right angles to the shells long axis was fitted into the outside base of HE shell. Shell bodies were slightly smaller diameter than the barrel calibre, in smaller calibres such as 25-pdr this was 0.01 inches, in larger calibres it was 0.015 inches. The British used general engineering grade steel for shell bodies, '19 ton' yield strength, although they moved to higher grade 20 ton steel with the 5.5-inch 80-lb shell. This steel could be machined in the many engineering factories converted to war production, which was important because British shells were precision machined all over. Higher grade steel meant thinner shell walls, which in turn allowed more streamlining, a longer shell and hence more explosive filling for a given shell weight. '19 ton' meant the steel yielded at 19 tons/sq inch, tensile strength was a different measurement also expressed as tons/sq inch but giving a higher number for the same steel. The differences in strength depended on the relative amounts of carbon, manganese and molybdenum. Interestingly 17-pdr HE used 30 ton and 3.7-inch HAA 27 ton, while German shells were normally 26 ton. While the use of general engineering grade steel facilitated war production its disadvantage was that more of a shell's 'weight budget' was taken up by metal to provide sufficiently strong shell walls, leaving less for explosive. 19 ton steel limited the explosive content to 7% of shell weight, whereas 30 ton steel permitted 15%. The amount of explosive was important, not because of its blast effect but because the ratio of metal to explosive and the ratio of internal diameter to wall thickness are major determinants of the amount of fragmentation, see Table 1 in 'Weight of Fire'. Some mortar bombs had cast iron bodies, which was cheaper and adequate for the relatively low forces acting on the bomb when it was fired. engages with the rifling when the projectile is loaded into the chamber to centre it and stop it slipping back. Many patterns of driving band had evolved in WW1 and while these variations were still found on stocks of WW1 ammunition, the WW2 shell designs generally had only one design per shell type. The driving band design affected the ballistic properties, the ballistic co-efficient, of a shell. The driving band was a wider diameter than the calibre of the barrel, it varied from around 0.25 inches in large calibres to around 0.1 inches in smaller ones. Driving bands were fitted to a groove in the shell body with feathering to prevent the band rotating on the shell. The patterns of feathering were nationally distinctive and often different for different types of shells, important clues for artillery intelligence that could be gathered by examining shell fragments. However, at higher velocities, above 1200 ft/sec, copper driving bands deposit a film of copper in the bore called 'coppering'. In the chamber end of the bore this increases resistance to 'shot-start' and so raises the pressure needed to get the shell moving while coppering further along the bore reduces muzzle velocity. The UK solution to coppering was a piece of lead foil in the front of the charge bag. The standard shell for all guns was HE and its standard weight was when fitted with a standard fuze. However, different fuzes had slightly different weights while different types of filling could result in significantly different weights. For example 25-pdr BE smoke Mk 2D (see below) was about 21 lb 13 oz, while 25-pdr armour piercing shot was only 20 lb. Like other explosives HEs are compounds of Carbon, Nitrogen, Oxygen and Hydrogen and while they can be ignited and will burn they are characterised by being 'detonatable'. Detonation causes a high velocity detonation wave (or shockwave) that moves through the explosive. The shockwave transfers to any material surrounding the explosive, albeit at a different velocity that depends on the characteristics of the material. This shockwave shatters the surrounding material, in a steel shellbody it stretches the metal causing shearing and cracking that break it into fragments. In a shell the shockwave starts at the fuze and travels down the shell. HE shells were the most common and until early 1945 the explosive filling was either TNT (usually called Trotyl in UK in this period) or Amatol. At the start of WW1 Lyddite (basically picric acid) was the standard HE for British service. TNT based on toluene (a by product of the dyeing industry) was about to be introduced although efficient production methods had yet to be developed for its pure form needed for HE. However, the pure TNT needed for filling shells was expensive to produce and there were concerns about the availability of precursors, this led to the search for an alternative. Ammonal used by Germany and Austria was considered as was French Schneiderite (they all included TNT and ammonium nitrate) and there was some production and use of these explosives. However, Amatol, a mixture of just ammonia nitrate and industrial grade TNT discovered in 1886, was considered most suitable for large scale shell filling with British resources (ammonium nitrate could be synthetically manufactured). The issue was the proportion of the two components and eventually 80/20 (ammonium nitrate/TNT) became standard. Between the wars further manufacturing developments made 60/40 the preferred mix and this was used in WW2. However, in late 1944 a new and more powerful fill was adopted for shells - RDX/TNT and started to appear in small quantities in 1945, the reason for its introduction was improved fragmentation for anti-personnel effects by about 25%. RDX (also called cyclonite or hexagen) was a more powerful explosive, about 70% more powerful than TNT, discovered in 1899. British production started in the 1930's using the Woolwich method. However, it was difficult to mass produce with consistent quality and bomb filling seems to have had priority when a new factory at Bridgwater in Somerset started mass production in 1941. RDX/TNT remained the preferred British artillery filling for the remainder of the 20th Century. Needless to say HE shell design is not a simple matter, the strength of the steel body has to be balanced with the quantity, power and violence of the explosive to produce the desired fragmentation. The shell body has to be strong enough to withstand the firing forces, either by having thicker walls or using stronger steel. The effects of 'set-back' where the force of firing (around 40,000 g) puts the load of the shell onto its base and rotation which forces the load outwards have to be accommodated. If the internal shape is a cylinder then the filling can be preformed blocks, while hot poured filling enables more complex internal shapes. Of course thinner walls with less steel makes the shell lighter, which means less 'carrying power', so either more propellant is needed to achieve the required range or the shell has to be longer to increase the weight. The best anti-personnel fragmentation, fragments about 1/25 oz, requires about 25% of the shell weight to be explosive, which was never achieved in WW2. However, these small fragments don't go as far as larger ones despite their high velocity (over 3000 ft/sec) because they lack 'carrying power' and have far more air resistance than a streamlined bullet. Cast iron mortar bombs were limited in their HE content because too much causes the body to disintegrate instead of fragmenting. When a shell is shattered by the HE detonation the fragments fly outwards. Their direction is related to the ratio of the shockwave velocity in the explosive and fragment velocity (which is a lot lower), and the angle between the shockwave and the shell's casing wall. Fragments are projected outwards within a very few degrees of a right angle to the external shell wall face with a velocity of up to about 1200m/sec from a TNT filled shelled. However the direction of fragments is greatly modified by the terminal velocity of the shell, mathamatically a vector sum. More detail about the effects and fragmentation of HE shells is here. Of the many types of HE only a few were used with artillery projectiles. The key requirements are power (the amount of gas for a given weight of explosive) and violence (sometimes called brissance, the rate at which gases are produced). Violence is approximated by the velocity of detonation. There are several approaches to measuring relative explosive power but the British used the Lead Block Test and gave Lyddite a value of 100. Another key requirement is insensitivity, and the British again used Lyddite with a value of 100 for comparison, higher is better. Other requirements are a low tendency to sympathetic detonation, high stability in storage (explosives can react with metals or moisture), high melting point (ammunition can get hot in the sun) and low cost. The following table shows the key characteristics of some of the HE used by the British. The initial velocity of the fragments formed by a bursting shell is substantially below the velocity of detonation. 'Raw' RDX has a power of 167, VoD 8750 m/sec and sensitivity of 60 - 65. This meant it had to be desensitised for use in artillery shells, which reduced its power and violence as well as sensitivity. PETN was even more sensitive, 40, and until 1939 had been expensive, Pentolite was a mix of PETN and TNT and used in 20-mm AA shells. Baratol was a mix of TNT and Barium Nitrate, it was used in munitions such as anti-tank gun shells and 2-inch mortar bombs that were expected to encounter poor handling and storage by the users in harsh and wet conditions. Some Shellite, a modified from of Lyddite, was also used. RDX/TNT filled 25-pdr was about 20% more lethal than TNT filled and 60% more than Amatol 80/20. Both TNT and Amatol were difficult to detonate and did not give off any smoke when they did so, which often made ranging difficult. This meant that the explosive in the fuze had to be boosted by use of exploders and a smoke compound added to help observers see a shell's burst. Shells filled with Amatol generally had two exploders, those with TNT only needed one. In the latter case a smoke box (usually filled with red phosphorus) was substituted for the second exploder in smaller calibres. When there was no room for a smoke box the smoke agent was mixed with the explosive filling. The exploders were filled with an intermediate explosive, most usually 'Composition Exploding' (CE) a very energetic explosive (called Tetryl), although TNT crystals were used when CE supplies were short. In the 1930's there were still stocks of another type of explosive shell - 'Common Pointed'. These were for the WW1 era heavy guns (8-inch and upwards). They were filled with Shellite and had a base fuze. It's unclear if they were used during WW2, but it is unlikely because there were probably no suitable targets for them. The other main type of shell was smoke, the British had used White Phosphorus (WP) smoke shells from 1916. Smoke shells divide into two classes, bursting and burning. The best known of the former being WP, although the Wehrmarcht used an oleum (fuming sulphuric acid) & pumice mixture. WP filled shells had a small amount of HE around the fuze's exploder, similar to exploders in HE, to burst them open and disperse the phosphorus, which ignited when exposed to air. The shell case split into large pieces not small fragments. British shells were usually filled with WP through a plug in the side of the shell body. WP was hazardous to store and ship, British rules required that it was usually carried as deck cargo. WP remained in use with 3.7-inch Howitzers throughout the war because it was more effective in mountainous terrain and a WP shell was developed for 3.7-inch HAA to make observation easier when ranging. It was also used with mortars and was retained with some WW1 era guns. However, the British considered WP somewhat ineffective in most conditions because it was burning and hence hot so tended to 'pillar' upwards instead of spreading out. They had used a base ejected burning smoke compound of white and red phosphorus in addition to WP in WW1. However, in the 1930's they introduced non-burning smoke in containers base ejected (BE) from a carrier shell in flight. The smoke compound was hexachlorethane (HCE, also called 'Berger Composition'), and this shell design was widely copied. Hexachlorethane involved a highly chlorinated substance and zinc oxide to produce zinc chloride. This is very volatile and hydroscopic so it picks up moisture from the air to form a dense cloud. It's also quite cool so it doesn't 'pillar' like WP. The result is that less shells are required to produce and sustain a smoke screen of a particular length. BE smoke shells were activated by a time fuze to burst them in the air about 2� 30' above the angle of sight from guns to the target area (roughly 950 feet at 7000 yards). The ejected canisters followed the shell's trajectory to fall over about 20 - 30 yards along the line of fire, although they could bounce a greater distance if the angle of descent was too flat. The fuze action ignited the bursting charge (gunpowder), which caused three things to happen: the baseplate was blown out, the flash down the central core ignited a priming compound in the smoke containers and the pressure on the baffle plate ejected the smoke containers. Canisters burnt for 75 - 90 seconds. 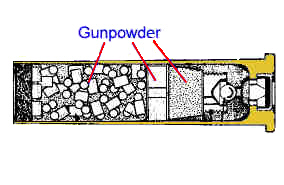 Figure 9 shows a 25-pdr Mk 1D shell with 3 smoke containers, but the initial 25-pdr smoke shell the Mk 1A, was not streamlined and carried 4 containers while Mk 2D still carried 3 containers but was 2 inches shorter. The standard screening smoke was white but red, blue, green and yellow smokes were introduced for target indicating in 1943. Coloured smoke comprised a fuel (such as lactose), an oxidiser and the appropriate coloured dye so unlike HCE it actually burnt. The Fire Planning page explains the use of white BE smoke in smoke screens. This base ejection method was also used with flare, star and incendiary shells. In mid 1944 is was decided to restrict flare shells to 4.5-inch Guns (the longest range gun of British design), their purpose was indicating targets to aircraft at night. At the same time development of incendiary shells (anti-personnel and anti-material) was stopped (shrapnel pattern incendiary shells had been used in WW1). The same technique, but without the need to ignite pyrotechnics, was again used with propaganda shells where the payload was leaflets (about 200 sheets in a 25-pdr shell) and 'window' (strips of metal foil used to 'white-out' radar displays). For propaganda shells BE smoke shells were modified in theatre by having their smoke containers removed and replaced by leaflets. 25-pdr chemical shells also used base ejection, although bursting shells had been used for this purpose in WW1 and some of these stocks still existed at the outbreak of WW2, notably for 6-inch Howitzers. Flare and incendiary shells used BE canisters, basically the same as smoke apart from their composition of their pyrotechnic filling. Flare shells were the nighttime equivalent of coloured smoke, being available in green, red and yellow. The main ingredient was magnesium powder, with small amounts of other chemicals and a salt to give the colour - Barium for Green, Strontium - Red, Sodium - Yellow and Copper - Blue. However, in star shells a single canister descended under a parachute and the canister was ignited at the top instead of through a central tube. Base ejection parachute star shells were first introduced in WW1 to replace the shrapnel type that had been in British service for many decades. Their active ingredients were usually Magnesium powder and Sodium Nitrate. Like the BE smoke shell, the fuze ignited the burster, which ignited the igniting, priming and star compositions, and acted on the wood block, star container and parachute support to force out the base plate and started the ejection of the star, which was completed by the parachute pulling it out. Chemical shells operated slightly differently because the chemical was contained by the shell and not in separate canisters. In the chemical shell the burster caused the piston to shear from its fixture and act on the liquid chemical filling to force off the base plate and so enable the filling to be ejected. Several types of anti-tank projectile were used by field guns. 18-pdr used a solid nosed and very thick walled shell with an aluminium container filled with 0.5 lbs of shellite explosive and fitted with a base fuze. 25-pdr relied on solid shot. Late in WW2 an anti-tank shell was introduced for 3.7-inch How in Burma. It was a much more modern HEAT shell with a nose fuze. Onto these were additional markings that provided further information. For example where coloured smoke or flares were carried then the colour was marked on the shell in words. Figure 12 - 25-pdr HE Mk 1D (Fuze No 117) and Smoke Mk 1D (Fuze No 221) Markings. The markings shown are the main ones, in addition to painting and stenciling there were also stamped marks. The red band indicated a filled shell while red crosses indicated a filling suitable for tropical use. The green disc on HE indicated a red phosphorus smoke box. The numbers are design numbers and that in the white box is the 'Superintendent of Research' (SR) number for the smoke composition. There were several additional markings including the filling factory and date, and various others that only appeared if applicable. Fuzes had various stamped marks, cartridge cases had stamped and stenciled marks, charge bags were also marked and primers had stamped marks. The main marks were also stenciled on ammunition boxes. In WW2 most British field artillery fuzes were at the nose of the shell. British fuzes were categorised as shown in Figure 13. The WW2 generation of field artillery nose fuzes all had 2-inch gauge fittings with a left-hand thread (from the perspective of fitting a fuze into a shell) and fuze bodies made from brass or zinc alloy, but mainly the former, and reached about 1� inches into the shell. Most fuzes evolved through several marks during the war. British and US fuzes had different gauge threads so they were not interchangeable. When fuzes were not fitted to shells during production they were usually delivered in boxes of 20. 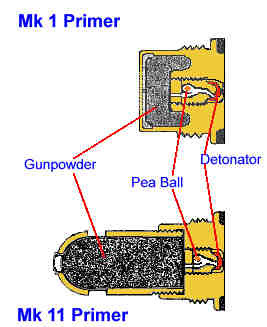 All fuzes had a mechanism to initiate them, a detonator (a few grains of sensitive explosive) and a magazine (later called a 'booster') filled with gunpowder or CE. If gunpowder was used it was called 'igniferous' or 'combustion' and required the addition of a 'gaine' if the fuze was required to detonate a high explosive (CE) in an exploder. The magazine for fuzes used with pyrotechnic ammunition (smoke, etc) was quite small and igniferous because it only had to ignite a gunpowder bursting charge (see above), these fuzes only went about � inch into the shell. While Percussion fuzes were ground burst, Time fuzes activated some time after they were fired, this enabled shells to burst in the air. Time fuzes had to have some means of measuring time, and this fuze length had to be calculated and set on the fuze. Graze fuzes were designed to detonate if the shell decelerated appreciably, since this took some time (relatively speaking) they were not instantaneous and were always slower acting than Direct Action (DA). This meant that they actually had a delayed effect and gave significant cratering, penetrate walls or, with a flat angle of descent, a ricochet burst. Some fuzes had both DA and graze, and some graze fuzes also had a Delay option. Delay fuzes traveled further after activation before exploding than graze fuzes did. In contrast DA fuzes were initiated by the direct action of something reasonably solid (such as the ground) compressing the tip of the fuze nose, but would result in blinds at very small angles of descent when the fuze nose did not hit something solid. For example with 25-pdr this translated into a minimum range of about 2000 yards at its lowest charge (assuming the target was on level ground), more for higher charges. Such fuzes (No 106) first entered service in 1917, and amongst their advantages was reduction in the amount of deep cratering that had afflicted the Western Front from 1915. British DA fuzes had a long striker from the nose to the detonator close to the magazine, see Figure 16. Some other nations, notably the US, used a short striker and detonator near the top of the fuze with a long flash tube to the magazine. In practice most Time fuzes were 'Time & Percussion', with the percussion generally provided by a graze action. The timing device was either combustion (igniferous) or mechanical. In combustion fuzes special quality gunpowder that burned at a known rate was held in an internal channel. Setting the fuze aligned a flash hole with the appropriate time place on the channel so that the flash is transferred to the magazine at the right time. UK generally used a Thiel mechanism for its own designs of mechanical time (MT) fuzes. The Thiel mechanism was 'powered' by a spring and used an escapement, in essence a clockwork mechanism. Other mechanisms, Junghans and Dixi, used centrifugal force as 'power' with either gears (Junghans) or balls (Dixi). 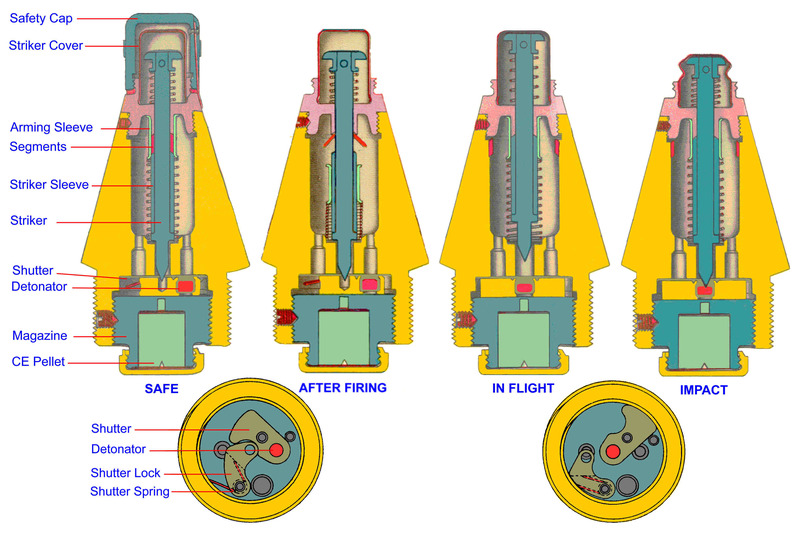 US MT fuzes used Junghans mechanisms. This reflects the distribution of technical 'loot' after WW1, the US took Junghans while UK took Thiel. Dixi was Swiss. On 18 December 1944 a new type of Time fuze was released for field artillery use in Europe - VT. Introduced in 1943 it had been restricted to AA use where the likelihood of the enemy recovering and copying blinds was negligible. The British had started development but transferred it to the US when the US entered the war and all VT fuzes (over 20 million) were manufactured in the US. The VT fuze was one of the most important secret weapons of WW2, it was very effective against V1 flying bombs, reduced the effectiveness of the Kamikaze offensive in the Pacific and if copied by the Germans would have had a disastrous effect on the Allied bomber offensive (although an electronic warfare competition would have ensued). VT fuzes used miniature radars to sense proximity to something solid (aircraft in flight or the ground). The term 'VT', meaning 'variable time', was adopted to obfuscate the proximity mechanism of the fuze. Unlike later versions these early VT fuzes started transmitting soon after firing and 'early bursts' were numerous. Figures 14 and 15 show most of the British field artillery fuzes of the WW2 generation for streamlined shells. Of course the older generation of fuzes remained in service with the WW1 generation of guns and their ammunition. These 'legacy' guns (including 3.7-inch How) used the earlier DA fuzes Nos 44, 106E (standard), 115, and 101 graze. No 106 was also approved for 25-pdr, 115 (a streamlined No 106E) for heavier calibres, both were percussion DA. No 16 Base fuze was used with Common Pointed shells. No 117 - DA, the standard fuze, minimum angle of descent 8 degrees. No 119 - DA and Graze, it could be fired 'cap-on' for a graze action. This made it effective against targets behind 'light cover'. No 231 - Percussion and graze action with delay, the length of the delay action was reduced from 0.1 seconds to 0.075 seconds in 1943, mainly to limit the depth in penetrated into the ground before detonating - as much as 8 feet in North Africa! It was used for cratering and ricochet airbursts. No 232 - Percussion and graze action, no delay. No 118 was a percussion fuze in naval service. No 117C was No 119 converted to No 117. No 210 - a mechanical time (MT) fuze for use with HE shells that was introduced early in the war and does not appear to have been widely used, it was deemed obsolescent by late 1943. Its lack of a percussion function made it less than ideal. 60 second maximum time. No 213 - a MT and percussion fuze for use with HE introduced in 1944. No 183 - time only by combustion used with star shells. 30 second maximum time. No 188 - time only by combustion used with star shells. 48 second maximum time. No 220 - time and percussion fuze used early in the war with non-streamlined smoke shells. The time function was by combustion. No 221 - a time and percussion (graze action) fuze used with streamlined base ejection smoke, star, flare and chemical shells. The time function was by combustion. 50 second maximum time. No 222 - a time and percussion (graze action) fuze used with HE shells including airburst ranging. Could also be used with BE smoke set to 0 for local emergency use. The time function was by combustion, basically it was a No 221 fuze with a gaine added to enable it to detonate exploders. 50 second maximum time. T97 - a VT fuze for 25-pdr and 3.7-inch How. The problem with VT fuzes was their size, their fuze cavity had to be about 3� inches deep due to their battery power supply and pre-transistor electronics. The battery included an energiser in a glass ampoule that broke when the shell was fired. 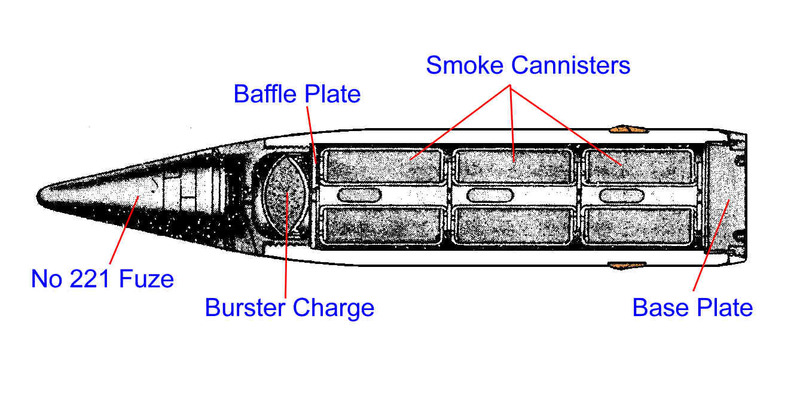 In British shells the deep cavity was achieved by removing the normal exploder and smoke pot and using a short exploder below the fuze. T100 - VT fuze for 5.5-inch and 7.2-inch. Combustion fuzes were far cheaper and easier to manufacture than MT fuzes but they were less accurate and consistent, the actual time of functioning could be up to about a quarter of a second different to the time set. This time variation represented a noticeable distance for the shell velocities involved. They were adequate for bursting smoke and flare shells, where exactness wasn't too important or airburst ranging when the mean of several bursts was used. But they weren't good enough to burst a reasonable proportion of HE at the desired height of about 30 feet above ground at longer ranges. Even with MT fuzes less than 2/3 of ranged shells burst at an effective height. The great advantage of VT was that more than 90% did, and without ranging the height of burst. However, combustion fuzes had always been used with shrapnel, and were effective at those ranges. Obviously powder burning fuzes were susceptible to damp, so not only were they delivered in sealed containers but they also had a fuze cap sealed over them that was removed just before fuze setting. The Arming Sleeve is set-back by firing acceleration, which allows the Segments to move out under centrifugal force of the spinning projectile. A spring pushes the Striker forward enabling centrifugal forces to unlock the Shutter and causing the Detonator to align with the Striker. Impact drives the Striker into the Detonator. Time fuzes (except VT) had to be set to the required fuze length. Until the introduction of Fuze No 213 time scale was usually arbitrary (ie not seconds), typically the highest setting was 22, which represented something between 40 and 60 seconds depending on the fuze model. The reason for not using actual time in igniferous fuzes was probably because their burning speed was affected by atmospheric conditions. The exact fuze length was, of course, also affected by the MV of the gun firing it, so each gun required its own fuze length. This could be calculated in the Troop Command Post, but the British preferred the 'gun rule' approach, whereby the range was ordered and each gun found its own fuze length. The instrument for this was the fuze indicator (usually called 'fuze bar indicator' because of its shape), which had originated before WW1 for use with shrapnel. This converted range to fuze length, it also allowed for muzzle velocity and a corrector setting, which enabled a correction for non-standard conditions to be set and the means for observers to range the height of burst. Using the range was the simple solution for British gunnery because it was ordered to guns and set on the clabrating sights to produce the elevation angle. Of course it also meant that fuze indicators had to produced. In the example shown, No 20 for 25-pdr, the fuze slide was graduated for Charges 1 and 2 on one side and Charge 3 on the other. In use the MV correction scale plates for each charge were set and locked in place against the current MVs. To find a fuze length the index mark on the fuze slide was set against the ordered charge and corrector scale (100 by default) and the fuze length read at the ordered range. A different corrector could be calculated for non-standard conditions or found by ranging the height of burst with the observer ordering changes to the corrector. The surge in need for fuze indicators (new fuzes, intermediate charges, 5.5-inch 80-lb shell, US origin guns and ammunition) was a challenge. Initially wooden indicators with paper scales stuck to them were used until the production of engraved aluminium versions could catch up. The original ones, such as the No 20 shown above, were made from engraved manganese bronze. A new design of fuze indicator, similar to the separate gun rule, was also introduced. Figure 18 shows that for 25-pdr using fuze No 213 at charge 3. The procedure was the same as for the earlier model, but the data was presented in a different way, the main difference being a combined range and corrector reader that was moved along the body of the instrument. Once the fuze length had been determined from the fuze indicator it had to be set on the fuze. This was done using a fuze key, and fuze keys were also used to remove and insert fuzes. Later in WW2 Fuze Setters were introduced. 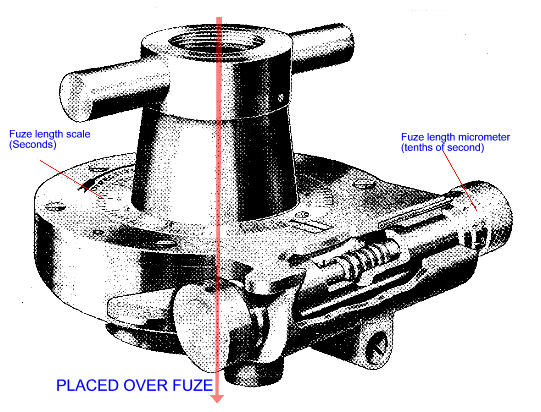 The fuze length (found using the fuze indicator) was first set on this, and the setter placed over the fuze nose so that lugs inside the setter engaged notches in the rotating part of fuze nose (which were also used with fuze keys) and the non-rotating part. The setter was then turned until it reached 'stops', which meant that the correct fuze length had been set. The advantage of the setter was that once it was set correctly all the fuzes would be as well, even in bad light, it removed another source of mistakes. Mortars, being ML, fired a differently configured round and generally used simpler components than QF and BL, not least because they had far lower muzzle velocities and the barrel was not rifled. SB (4.2-inch mortar) had exactly the same configuration. Figure 21 shows the configuration of a mortar bomb. The main types of 3-inch bomb were HE, WP Smoke, Star, Observing Smoke and Practice and the only fuzes were direct action. 3-inch bombs were steel or cast iron and the normal HE fill for a 10-lb bomb was about 1.2-lbs of 80/20 Amatol topped with TNT, there was also a 7�-lb HE 3-inch bomb. HE bombs were painted with copal varnish, giving them a brown colour. Observing smoke seems to have been either titanium tetrachloride (FM) or chlorosulphuric acid/sulphur trioxide (CSAM). The standard direct action fuze was No 162. A time fuze, No 390, was used with screening Smoke, coloured Smoke and Flare bombs. The standard projectiles were streamlined, Figure 21 above, but there were also cylindrical bombs used with carrier munitions and No 390 fuze. The primary 3-inch cartridge, filled with Ballistite A was fitted in a perforated container that had vanes welded to it and attached to the base of the bomb case. The secondary or augmenting cartridge contained NC(Y) propellant (a proprietary single base formulation 78% nitrocellulose and 12% barium nitrate), doublebase M4X was an alternative. Initially the secondary cartridge was a celluloid container but this was replaced by a cambric bag, it was held between the vanes by a retaining spring. There were other fuze types for 3-inch, Nos 138, 139, 150 and 152. The arming mechanism relied on set-back when the bomb was fired and the detonator was on a shutter. The parachute Star shell was airburst by a delay composition that was ignited directly from the cartridge and ejected the star and its parachute through the nose of the bomb. The end of WW2 brought simplification. Many guns and their ammunition were declared obsolete and withdrawn from operational service, although some were retained for training use or just held in ordnance depots. This left mostly 75-mm, 25-pdr, 5.5-inch (80 lb shell only), 155-mm and 7.2-inch, with 4.2-inch mortars being added, in field units. Fuzes rapidly reduced in variety, with No 117 becoming ubiquitous and fuze No 213 provided HE time airburst. 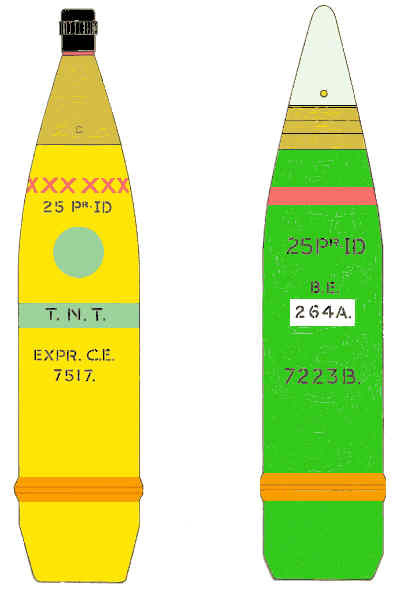 25-pdr was limited to HE, BE smoke and star, a new type of bursting coloured marker shell, using PETN explosive (26%) and coloured dye (red, orange or yellow), was designed but did not enter service, a new anti-tank shell, HESH, replaced shot. 7.2-inch and 5.5-inch only had HE although for the latter development was completed for coloured smoke and flare, and incendiary. New VT fuzes, designated with the new system of Land Service numbering, L14 and L21, were introduced for 25-pdr, and L23 for 5.5-inch, called controlled VT (CVT) they had a timing mechanism to switch on the radar transmitter a few seconds before impact and so eliminate the early bursts problem. The variety of propellant was significantly reduced and eventually N and NQ became the only ones used in British ammunition designs. RDX replaced Picrite wholly or partially in triple base propellant, but have yet to enter UK service. Various additives were adopted to reduce barrel wear. HE shell fill became RDX/TNT Type A (60/40) or Type B (55/45), with the latter usually used to 'top-off' the former, although RDX/beeswax was sometimes used for this, the fill was hot poured (not cold pressed as used in many countries), a difficult process because RDX has a narrow temperature band between melting and breaking-down. In 2005 a new HE fill was adopted, ROWANEX a plastic bonded explosive based on RDX, which met the requirements for insensitive munitions. Improved HE fragmentation was achieved by the use of new steels and shell bodies where the ogive wall became significantly thinner. A new method of measuring HE insensitivity was adopted and 'Picric Acid' cosmetically replaced 'Lyddite' as the baseline for explosive power. In 1969 NATO agreed various standardisation measures for ammunition. These were full ballistic standardisation where ammunition from different nations is indistinguishable in terms of its ballistic performance, and partial standardisation when ammunition from one nation was safe to fire from the guns of another. The goal of full standardisation is to enable foreign munitions to be fired using normal fire control data. This all means that chamber pressures must not exceed an agreed maximum and that muzzle velocities must be the same. Basically this meant agreed propellant testing procedures and tolerances so that ammunition of a particular type produced by one nation performed the same as that produced by another. It also introduced standard rules of lotting and batching ammunition. In the 1950's a few 155-mm M44 SP howitzers were introduced with US ammunition to replace the last of the 25-pdr Sexton SPs. However, in the early 1960's the Oto-Melara 105/14 Model 56 was introduced. This 105-mm gun used the US HE M1 semi-fixed round ammunition family, which UK had used with 105-mm M7 Priest SPs in WW2 . UK produced this ammunition as L41 and subsequently L57 HE rounds (L33 HE shell), L42 WP round, introduced their own HESH design for direct fire against tanks, their own BE smoke design (L51 round) and a Bofors design illuminating shell (L55 round) ('illuminating' replaced the term 'star'). US fuze designs were used apart from L36, 62 and 66 CVT (different sub-models used different frequencies, and had differently coloured bands on their nose cones) with the L57 round and Swiss MT fuze using the Dixi mechanism and featuring a vernier scale with the L55 illuminating shell. US ammunition was also used with 8-inch, 175-mm and 155-mm M109, although a UK cartridge, L6 using re-cycled 5.5-inch propellant, was adopted for the top charge with M109A1 instead of the US red bag M203 and L78 CVT instead of M513. New UK guns were developed in the '50's, '60's and '70's. The first was a QF 88-mm field gun, it never entered service and was designed to fire 25-pdr ammunition with a new high lethality 22 lb shell planned. Next came the Gun QF L13 on the Abbot 105-mm SP, this required the development of a new ammunition family, called '105-mm Field' (but less officially 105-mm Abbot) to distinguish it from the US 1935 pattern 105-mm Howitzer M1 family. 105-mm Field is still used with Gun QF L19 (105-mm L118 Light Gun). The third was for the tri-national 155-mm FH70, UK designed the propellant system and HE shell. This ammunition family also became the war stock for UK's M109 and subsequently AS90. The new 105-mm and 155-mm projectiles had larger crh, NATO standard fuze wells, and more explosive than the WW2 US designs of the same calibre. In the early 1970's a 155mm bomblet shell was developed, however, it was unsatisfactory and did not enter service. UK ammunition design criteria recognised three damage levels: destruction, disablement and neutralisation. Most ammunition was designed to disable - preventing the target from functioning correctly within, or for, a specified time. Both QF and BL charge bags were colour coded (red, white, blue, orange, green, mauve, yellow). NATO ammunition markings were also used for new shells. The HE body colour became Deep Bronze Green (the vehicle colour at the time) with a yellow band to indicate HE filling, while illuminating became white and smoke changed from Light Brunswick Green to Eau-de-Nil. There was considerable simplification of the secondary markings. 105-mm Field demonstrates continuity and change. Cartridge and shell are loaded separately but the primer is initiated electrically (this had long been used with the tubes for some naval and coast BL guns). There were two marks of ammunition, the Mk1 used for the first few years' training while war stocks of Mk 2 were created. Mk1 used HE and WP shells of the US M1 design (L33 and L32) with reduced charges (L32 cartridge charges 1 - 4, L34 cartridge charge Super) giving reduced maximum range (15 km). Mark 2 ammunition uses L35 cartridge charges 1 - 5 (although Charge 5 has a separate 5th increment attached to the top of the cartridge case) and L36 cartridge charge Super (17.4 km max range). There were also two sub-zones A and B (L1 cartridge), to provide short range high angle fire. However, L1 was soon replaced by a plastic spoiler fitted over the shell nose (a device first adopted by the French in WW1 in an attempt to convert their 75-mm Gun into a howitzer) and used with charges 1 and 2. The L31 HE shell used with Mk 2 is 7% heavier and contains 20% more HE than the US M1 shell design. The original 1965 requirement for the Light Gun also sought a 20km extended range HE shell, however, this does seem to have been developed. Other shells are the Bofors illuminating L43, BE white smoke L36, bursting coloured marker shells (red L37, orange L38) of the types originally designed for 25-pdr and HESH for direct fire anti-tank. The 105-mm L118 light gun uses the Mark 2 ammunition, albeit with slightly less range due to its slightly shorter barrel. In 2005 a new shell, L50, filled with insensitive HE and slightly greater length was adopted. A new base ejecting red phosphorus smoke shell, L52, was also introduced. Red phosphorus smoke is a multi-spectral obscurant, it blinds beyond the visual spectrum. 105-mm Field cartridges are delivered in plastic containers, fuzed shells in paperboard tubes, two of one or the other in a steel box. FH70 has a BL ordnance. The propellant is a UK design with 3 cartridges, which eventually became: L7 charges 1 - 2, L8 charges 3 - 7 and L10 charge 8. L8 has a novel configuration where the base charge (3 - blue bag) provides a sack for charge bags 4 - 7 containing long cords of propellant. The thin wall HE, L15, contains 64% more HE than the US M107 and being about 25% of shell weight is about the optimum anti-personnel use. BE smoke (DM105) and illuminating (DM106) are German designs. The highly lethal L15 presented a problem on the small artillery training areas in Europe so training shells (L17 and L19) and a UK version of HE M107, designated L21, were introduced. They also provided a 'reduced effect' option for AS 90 in peace support operations where collateral damage is a concern. Another innovation with this ammunition was its packaging, 'unit load containers' (ULC) holding 17 fuzed shells in paperboard tubes and 17 cartridges in plastic containers. This significantly reduced ammunition preparation effort on the gun position. All-terrain fork lifts and cranes on ammunition vehicles moved ULCs, although the replacement ammunition vehicles used demountable flatracks (10 ULCs each), which streamlined the complete ammunition supply chain. A new series of fuzes was introduced with 105-mm Field. Percussion fuses were L32, and later L85 and L106, they were DA and graze (the latter was selectable to give a delay of about 0.05 seconds). L32 was a similar configuration to No 117 with additional safe arming features, L85 was a modified US M557 having a detonator at the front of the nose cone connected to the booster at the fuze base by a flash tube. New time fuzes were L33 MT and percussion, and L81 and L92 MT (used with illuminating and BE smoke). The CVT fuze was L27. Fuze lengths were measured in actual time and the fuze setter was like the one in Figure 18. Fuze indicators remained in use until the early '70's when command post electronic computers (FACE) and data displays on guns (AWDATS) were introduced. Most significantly, in the 1980's new electronic fuzes were adopted, this followed a 1970's design that did not enter service because it was insufficiently reliable for peacetime use over publicly accessible areas (notably in Germany). The L116 multi-role fuze (CVT & percussion) fitted to HE and marker shells and L132 electronic time fitted to smoke, illuminating and other cargo munitions, and a common electronic fuze setter that could be manually set or electronically by data transfer from a gun display unit. L116 and L132 are being replaced by Junghans electronic fuzes (L166 and L163) that comply with insensitive munitions requirements and can detonate insensitive explosive, and L7 fuze setter using NATO standard induction fuze setting. L166 is a true multi-function fuze, it has options for point detonating (super quick or delay), time (up to 199.9 seconds), proximity (10 or 3.5 m height of burst) and foliage penetration (choice of distances below the canopy). Finally, there was a change in terminology. BL became BO (breech obturation) and QF became AO (ammunition obturation). Many pamphlets and notes were produced by training establishments and physical details of ammunition were also given in the Hand Book and some details in the Range Tables for each gun. Regulations for Army Ordnance Services, Part 2, Pam 3, Markings on Land Service Projectiles for Guns, Howitzers and Mortars, 1934.